By Jasmine Robinson: It’s a big question for a short blog post, but over the course of my three month placement with Policy Lab, it is one that has been constantly on my mind. The Lab is a mix of experienced civil servants, and designers and researchers new to government. So there’s often lively debate: for example, on how to design effective research with the time and resources available; or how to make and test prototypes with people who are most representative of the end user (the citizen). Those of us who are new to policy might feel that processes could be either more experimental or more rigorous. Those with policy-making expertise know the risks and rewards of tried-and-tested methods, and understand the complex reality. It’s this debate - the creative tension, if you like - that fosters innovation and makes things interesting. As a team - and in the spirit of the OneTeamGov movement - we’ve wrestled with the twin challenges of helping designers learn more about policy, and giving policy-makers design tools that work for them. We’ve been working on a map of the policy ‘ecosystem’ (sneak preview below), which we hope to share with you shortly. As I’ve discovered by attempting to map it, the policy-making process is complex and potentially messy, with no ‘right way’. But this very messiness is what might make it particularly suited to design methods. Design research has the advantage of being fast, instinctive and reflexive. It is led by the desire for empathy with the user of the service or product being designed, so that the design outcome can be more effective and desirable to them. 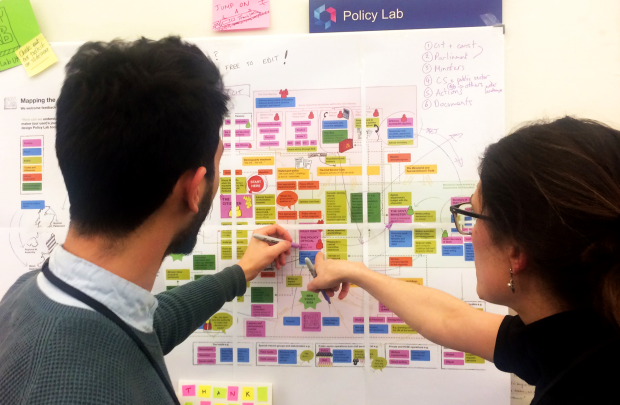 Policy Lab tools bring the end user into the room, helping develop that empathy. For example, personas created using ethnographically-informed research can provide rich picture of someone’s whole life, not just their interaction with the policy. This isn’t about manipulating the emotions of the policy maker. It’s about developing a mindset which can create innovative and intuitive interventions. The tools are useful in understanding the type and scale of potential intervention. 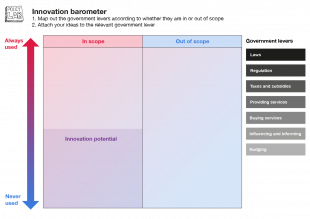 For the policy novice, Dr. Andrea Siodmok’s grid of 28 possible government interventions is a good place to start. We’ve been testing different ways of using the grid: for example taking the seven styles of intervention, thinking about those that are available to the policy team, and mapping ideas accordingly. Here’s an example of one prototype: our ‘innovation barometer’. And of course we shouldn’t forget that policy-makers are one of our (Policy Lab’s) users. Policy-makers have constant demands on their time and need to balance a range of competing considerations. We need to be sensitive to their needs and take them into account when designing research. We’ve started to use the ‘project circle’ (below) a bit like a design brief - setting out what we are trying to do, but also the real, human hopes and fears we all invest. What's it good to know before starting a project? 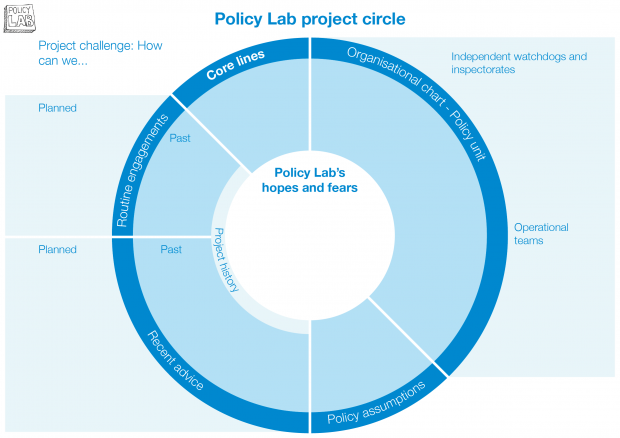 Policy Lab is in a rare position to combine both design and academic research in a way that builds a rigorous evidence base, but is rapid, reflexive and user-centred. In my short time here, I’ve seen the Lab’s process constantly evolve, informed by the participants from each project, and improving every time. 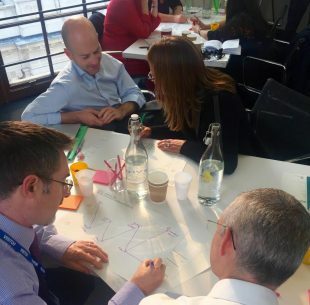 Both policy-making and design are iterative and non-linear, and we can learn a lot from each other in the creative environment that Policy Lab fosters. By Jasmine Robinson, winner of the 2017 “Learning for Life” RSA Student Design Award Brief.